Vacation rental condominium. Sleeps 4, 2 bedrooms, 3 bathrooms. No pets allowed. Looking for the best of the best that Keauhou Kona Surf & Racquet has to offer? You've found it. The views from 5-303 are jaw dropping!! Now this is Paradise!! Incredible coastline views from Building 5! The top floor is second to none!! Relax and enjoy the water being DIRECT OCEANFRONT! These beautiful chairs pop up and down for comfort!! THIS IS YOUR VIEW!! COASTLINE!! No tunnel vision views!! Welcome to the amazing main living room area! The art, furniture, & finishes are all high end. Luxury Oceanfront Living. 65 inch SMART TV waiting for you!! The details are phenomenal. The other side of the Living Room with additional seating. Penthouse living at it's finest here!! How gorgeous is this property?!?! Beautiful dining area for 4 here! Fully Equipped Kitchen with absolutely everything one could need!!! One of the Master Suites on the Main Level. Nothing but Golf Course Views!! Television in this bedroom as well! Golf Course Views from one of the Master Bedrooms!! The Penthouse Loft! Great King Sized bed, beautiful furnishings, own private bathroom up here as well!! The Penthouse Bathroom! Walkin shower up here as well. Sinks on both sides of this wall for conveniance! This is the sink on that opposite side of the wall with a walk in shower! Direct Oceanfront Living really is the best!! The views can't get better than this one!!! 3rd bathroom downstairs in the Common area for guests. Walkin showers in every bathroom! Gorgeous Pool Area remodeled in 2016!! Direct oceanfront living at it's finest!!! Book today!! Views of the Crashing Waves right from your lanai! Call/Text Blake, Property Manager at 808-987-9295 to get best rate! 5-303 at the Surf & Racquet Club is a jaw dropping, absolutely gorgeous top floor condo located in the BEST building in the complex. Building 5! The most Private of them all! Come stay at this beautifully remodeled 2-story oceanfront unit and you will be more than pleasantly surprised. From the over-sized, elegant master bathroom to the impeccably designed kitchen, the attention to detail will impress you. Enjoy views of the ocean or the golf course from virtually everywhere in the condo. Top-of-the-line selections include custom kitchen cabinets, onyx countertop, tile flooring, vinyl sliding lanai doors, beautiful furniture & more! This property has everything you'll need from Wifi, Telephone Service, beach gear, you name it, it probably has it! BOOK IT NOW BEFORE YOU'RE TOO LATE! Yes, was as pretty as the pictures! We had a lovely visit at the condo in building 5-303. Very Quiet, relaxing, with whales spouting and waves crashing. Very nice unit. Stayed four nights. Had a couple of maintenance issues - most were addressed on the second day. Great view and location. Quiet as it is a top floor unit. Seamless rental experience. Condo has a spectacular view and is very comfortable with quality furnishings. We were pretty much satisfied with everything about the condo except there is no A/C. Other than that, we enjoyed our stay. The place was clean and location was ideal. Aloha Emil, and thank you for your review! We're happy you were able to stay with us in Kona. While we do advertise if a unit has A/C, we would be happy to help you find a unit with A/C or that best suits your needs for your next stay. Mahalo, and we hope to see you again soon! Aloha, thank you for notifying us of the ice machine and your advice on ice makers! We are looking into replacing it. We're happy to hear that you enjoyed your stay in this unit, and that you got to experience falling asleep to the sounds of the Big Island. We hope to have you with us again! Mahalo. We had a wonderful experience staying in the condo. It was perfect for our family. We enjoyed the stay very much, with one exception. We found a large roach early on and the regular pest control was done while we were there, but we found another large roach again. I understand bugs, but these two were very large and healthy, seems as thou the pest control was not working. Like I said everything else could not have been better. The beach towels and toys were wonderful and the lanai was great, we saw spinner dolfins and the cruise ships, very nice. The pool was great and the area by the ocean was enjoyable. The location was good for us. Great views, well appointed unit, close to restaurants, shopping and activities. Great for families. As advertised in all respects. Two couples, GREAT condo, beautiful location,great time, weather--not so great: lots of cloudy days. If we go to Hawaii again, would love to stay here! This is our second stay at this unit. It has a very comfy feel and is nicely furnished and decorated. The view from the large lanai is incredible. Full 180 degree view of the ocean and the sunset. This is the only place where we have seen the Green Flash! And on our last evening we had a charming visit from a whale who performed a 15 minute "tail-lobbing" show for us that was simply outrageous. The condo is well equipped with all that you might need for cooking, for beach visits, and for doing your laundry. It could use more large ceiling fans since there is no AC, and the ones that were working did not have remotes that were working this time. But there are big fans on the lanai which is helpful on those hot days when the Tradewinds are still. Nice to have a big screen TV for watching the Olympics at night these past two weeks. Mahalo to the owners and to Knutson for making our stays easy and comfortable. It would be hard to stay anywhere else now that we have been at the KKRSC #5-303. Sounds of crashing waves beneath lanai worth every penny! This rental unit was in a perfect location. The ocean on one side and a golf course on the other. Unit 5 is the most desired unit in the complex. It’s quiet and has the best view. The room had everything we needed for our stay. Did I mention the view? Wow!!! We spent every morning sipping coffee on our linai looking at the ocean. We even saw a couple of humpback whales one day. We were very happy with our ten day stay. The unit is very clean, spacious and kitchen is well equipped. The living room has a large screen TV along with small screens in both bedroom. There is no AC but really not necessary a very comfortable ocean breeze along with plenty of fans keeps you comfortable. There is a supermarket and restaurants close by with Kona only a short drive away. Kalahaluu Beach down the road is a good place for beginner snorkelers. The grounds are very nice with a large pool, tennis courts, and BBQ grills. A large lanai with chairs and tables overlooks the ocean. My only (minor) criticism is the interior could use better lighting, somewhat dark for my taste. We would definitely stay there again. The property was very clean and well maintained. The property management company was professional and helpful in every aspect. Condo was well-updated and in a great location near beaches, restaurants, and activities. View was great from the balcony! Furniture was very comfortable. No air conditioning, but lots of fans available. Plenty of space for my family. Super clean, very well designed and furnished, much mire than exoected, incredible views! Oceanfront! This was a beautiful condo with a magnificent view. Location was great. Ocean right off the lanai. Sound of waves crashing on the rocks. This is probably the best Hawaiian rental unit that we have ever had. It is difficult to pick which is the best feature of this rental. The rental is huge and the lanai faces West for amazing sunsets almost every night. At night, the lanai is a wonderful place to sit and enjoy a glass of wine and watch the sparkling lights of downtown Kailua Kona. On those days when the ocean is rough, there are spectacular visions of the waves crashing into rocks below. The interior of the rental is superbly decorated with local art, pottery and furnishings. The kitchen appears to have recently renovated, and comes fully equipped. There was nothing we had to go out and buy other than food. The two bedrooms were extremely comfortable. The king sized beds were a bonus as so many rentals have queen sized beds. Both bedrooms have flat screen TVs, but the bonus TV is in the living area. It has to be at least 60". The grounds are extremely well kept. The newly upgraded pool is ideal for all except divers, as there is no diving. The three tennis courts are in perfect shape and well lite so you can play into the coolness of the evening. Our dealing with the property manager Blake was smooth and helpful. In fact Blake dropped by shortly after we checked in, to explain the lighting system, and answering our questions. A very nice touch. 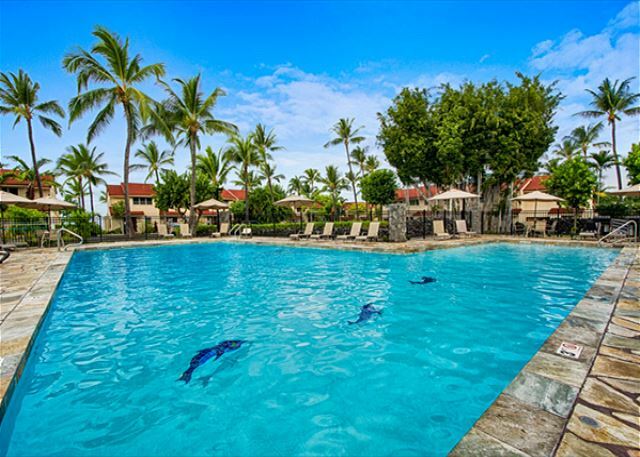 Based on these two weeks in this property, we have no concerns in recommending this property to someone who is looking for a vacation beyond your usual Hawaii stay. This top floor unit at the Keauhou/Kona Surf & Racquet Club in Building #5 was breathtaking! Comfy, clean, well-stocked with good furniture and bedding plus beautifully decorated with the Island theme. Quiet and serene. The real high point of the stay in this condo was the view over the ocean. Truly amazing with big surf and wild "blow holes" right there off the lanai but the top floor gave wonderful long views as well. You could see big fish in the waters using the binoculars and sitting right at the table drinking your morning coffee. Gorgeous grounds. Fun beach with its own petroglyphs. And the management team, led by Blake, was very responsive to our needs. Mahalo, Knutson & Associates of Kona!! This rental was exactly as described! The views were incredible. We would stay here again. Ocean view that can't be beat. Had a great stay at unit 5303. Everthing including the checkin and check out was seamless. The view from the deck and sound of the waves was soothing to say the least. Although there was no aircon there was a nice breeze off the ocean that kept us comfortable through the night. There are far to many pro's to mention about this unit and the only con was the very early mowers on the golf course were annoying to say the least. We loved staying at this condo! I spent most of my time sitting on the lanai relaxing and watching the waves hit the rocks. Kona is just a short trip away, and it's easy to kick off trips to all parts of the island from here. The condo is well appointed and has everything you need. There's even an appletv for when you need some down time! One warning: there's no A/C, but there are plenty of fans to keep you cool. It does get a bit humid in there during the day, but we were out and about for the most part so it didn't matter much. This condo definitely has the "WOW" factor. We loved our stay there. It's centrally located and beautifully appointed. If we go back to the Big Islamd we would absolutely stay there again. Highly recommend! this condo is just what you are looking for, well appointed, comfortable furniture, and most importantly; and exceptional view. The unit location right on the edge of the Pacific was great. The unit was in management transition but I sure that they will correct the minor problems with the property.